Do they have the ability to stream Netflix on Air Force One? This is not an idle question. Valentine’s Day was also House of Cards Day and President Barack Obama let us all know, via Twitter, that he too is a fan who has been aching for season two, which was released in its entirety yesterday for fans to gorge on. The problem: he was flying all of Friday, from Maryland to California. The whole evening was taken up dining with King Abdullah of Jordan in Palm Springs. The chief executive of the land confessing an addiction to a show that depicts the federal capital in such dark caricature might seem a surprise. But for the cast, who gathered for a premiere screening on Thursday, it was an exciting endorsement. It is one thing that all of Washington gorged on the first 13 episodes released all at once one year and two weeks ago. But now the Oval Office is hooked too? “It’s the coolest news ever,” said Kate Mara, who plays the reporter, Zoe Barnes, who becomes close, maybe too close, to the ruthless chief whip Frank Underwood, played by Kevin Spacey. Fans in the real world of politics in the District want us to know – of course – that their existences are entirely more monotony than Machiavelli. No one actually kills to protect their political advancement. It’s barely a secret that the opening instalment of the new season does not disappoint. No, I won’t say; just that as Underwood readies to be sworn in as vice president, keeping a lid on what happened to a certain dead Pennsylvania congressman becomes more imperative than ever. Such has been the anticipation on Capitol Hill that aides campaigned to have Netflix release it a day early because a snowstorm was due on Thursday and offices would be shut. The snow came, but no new season. One aide, Alex Conant, press secretary to Senator Marco Rubio, told Politico that the show “makes politics in Washington appear even worse than it is, which is a feat”. Embracing it hasn’t been a problem for politicians either. Several volunteered for an online news site to go on camera speaking some of Underwood’s famous season-one scorchers. Watch Trey Gowdy, a Republican from South Carolina, giving appropriate menace to, “I have zero tolerance for betrayal”, and somehow the effect is even greater than from the lips of Spacey. And slightly worryingly, the chief writer of the Netflix saga, Beau Willimon, revealed at Thursday’s screening that some of the most powerful figures in Congress have been advising on plot and characters. But we must repeat. 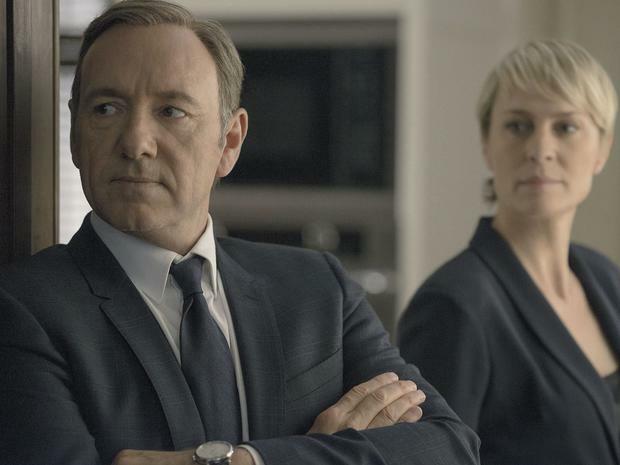 Mr Spacey and his onscreen wife, Robin Wright, are just actors. It’s not real. Washington isn’t like that. Which goes no way to explain why the main guest with George Stephanopoulos on his morning political show tomorrow on ABC, The Week, will be, yes, Mr Spacey.